Is Acarosan an effective answer to the mite problem? Was this the answer to the dust mite problem? It is obvious that anything which will kill mites without undesirable effects on patients could be a popular and effective way to deal with the ubiquitous dust mite, because avoidance of the most important allergen world-wide is so often difficult, expensive, or impossible. From 1988 to 1994 I personally conducted clinical trials of a German product called Acarosan which contains benzyl benzoate to kill the mites, plus a mixture of detergents to make the mite faeces stick together, and is presented either as a spray or a powder which is applied to bedding, carpets, and soft furniture. My trials were remarkably effective but the results are not acceptable for publication because nowadays all trials have to be carried out on a double blind basis, when neither doctor nor patient know if the material they are using contains the active agent or an inactive placebo. Double blind trials to assess the effectiveness of a remedy are ideally suited to testing a new drug, but when applied to an acaricide for killing mites creates difficulties which resulted in several inconclusive publications. The reason may be that the patients chosen were not selected in pairs carefully matched for their sensitivity to mites and the severity of their allergies before being allocated to the placebo group or the active group of patients. Without this precaution, which has not to my knowledge been applied in any trial, it would be easy to introduce unintentional mismatch in the severity of asthma, rhinitis, or eczema in the two groups of patients, and seriously distort the result. Also, no double blind placebo controlled clinical trial could last for from one to five years, as mine did! One might imagine that in spite of medical disinterest Acarosan would have become popular and widely used. However marketing was initially limited to clinics because the active principle is Benzyl Benzoate, and the Health and Safety Executive (HSE) were concerned about possible toxicity of this substance. The HSE made repeated demands for many very expensive toxicity tests which did not make sense because Benzyl Benzoate had been passed as safe for use in food in the USA in 1965, had been approved in Europe to a recommended daily intake of up to 5mg per kilo body weight in 1970, and finally by our Ministry of Agriculture Fisheries and Food (MAFF) in 1978. By the time the HSE granted full approval five years later the vendors, who had spent a great deal of money satisfying the requirements of the HSE, had lost interest in marketing the product. Acarosan also fell foul of the Food and Drug Administration in the USA for the same reasons, and sales in the USA were prohibited. Unfortunately no other company wanted to market it, so it has not been available in the UK since 1994, but could be obtained from Germany, where Social security paid for Acarosan until recently, when it was withdrawn because of lack of proof of efficacy. 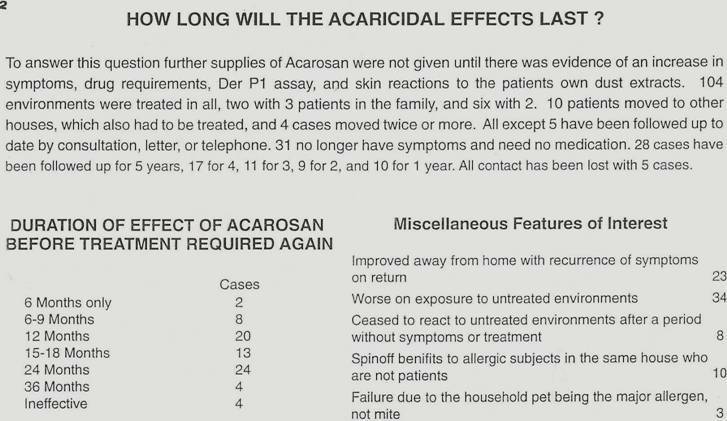 At one time it was hoped that when Acarosan had been shown to be an effective mite killer it would become prescribable by the NHS as a method of dealing with the mite allergy problem. Benzoate has again been banned in Europe because of safety concerns and its cost was reimbursed in Germany for many years. The concept of treating the home of the patient with Acarosan instead of treating some of the inhabitants of the house with expensive drugs seemed to make sense, and might have saved many millions of pounds from the NHS drug bill. Unfortunately there seems to be no possibility that this would ever happen here, where expensive drugs are routinely accepted as the only treatment. This lack of interest seems surprising because, since desensitising injections became forbidden in the UK nearly twenty years ago, no specific and potentially curative treatment has been available for mite allergic patients in this country, which probably has the highest incidence of mite allergy in the world. Avoidance of the ubiquitous mite, which is practically impossible to eradicate, is the obvious answer. Some double blind trials have found in favour of very expensive mattress and pillow covers, so they are often recommended. The first time I reported the remarkable results I was obtaining with Acarosan at a British Allergy Society Meeting a medically qualified person, who works for a drug company, said to my wife at dinner that evening “I do not understand why your husband wants to kill our best friends” A revealing remark? My long experience with Acarosan has convinced me that it is really effective, and that mismatch of the groups in the double blind trials is the reason why they were inconclusive. I now present my results using the patients as their own controls, hoping to stimulate interest in this approach to the world wide problem of dust mite allergy. This appears to be a practical, non toxic, and relatively inexpensive approach to the problem, but in meanwhile the Pharmaceutical Industry and the manufacturers of bedcovers will continue to thrive. I must declare that I have no financial or other interest in the promotion or sale of Acarosan, and that I was not paid for the clinical trial. To the practising physician the dust mite problem presents great difficulties in management. Total avoidance by relocation to a high dry climate, such as Switzerland where the mites cannot thrive, is rarely possible. Very few patients are willing to throw out their fitted carpets, soft upholstered furniture, duvets, blankets, and pillows and put up with bare boards, linoleum, tiles, or (more recently) laminated floors--- and perhaps also get rid of their pets who have become part of the family. All this especially if there is no guarantee that these extreme and expensive measures will be effective. The major source of mite allergen is the bed and mattress, where every night we supply warmth, humidity, and skin scales from our bodies as mite food. 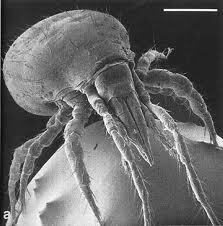 In their turn the mites produce the faecal pellets which are the source of the major allergen. 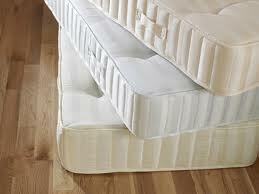 Special mattress covers are too expensive for impoverished patients in bad housing conditions who are most in need of them. Quality of covers is variable and the mattress is not the only source of mites, which can make themselves a home in any sofa, and in the depths of the fitted carpet. Measures to reduce the humidity to a level which will inhibit the multiplication of the mites are neither comfortable nor practical and very expensive. It is obvious that the only sensible solution is to apply an acaricide to kill them off as often as necessary, but no double blind trials have produced a clear result, probably due to mismatch in the severity of the allergy in the two groups. This failure to produce a clear result, plus the regulatory authorities anxieties about the toxicity of a spray or a powder containing a substance allowed in many soft drinks, has had the effect of discouraging the use of acaricides. If the acaricides contained potent insecticides, such as are contained in ordinary fly sprays which are used frequently in many homes, then it would make sense to be cautious. A recent and very comprehensive European review of the effectiveness of the many methods of control of mite and pet allergies reached the conclusion that there was little evidence to support the use of any physical or chemical methods of control of dust mites or pet allergens, based on published double blind placebo controlled trials. This result clearly suggests that in this country dependence on drugs is total, and that attempting to control mites is a waste of money. So, should we just give up trying to control the allergens in the environment, and depend entirely on suppressive drugs? In my opinion this would be to accept that we must await the day when it will be possible to stop patients reacting to environmental allergens by desensitising them. This could be accomplished either by the time-honoured method of injections of gradually increasing doses of allergen in common use everywhere in the world except the UK, or perhaps by using the self-administered sublingual method of desensitisation against mites which has been established to be free from risk by double blind trials in Europe. Modified allergens treated to make any reactions to injections much less likely have recently been developed and subjected to successful trials in Europe, and offer another possibility. Unfortunately it is likely that introduction of self-administered SLIT for desensitisation against mites will take many years because of the restrictions imposed on clinical trials in this country. I will now present a brief account of the clinical trial from 1988 to 1993, based on poster presentations and talks given at Allergy Society meetings in the UK, Switzerland, and the USA. None of these presentations attracted any interest, and the product has been unobtainable in the UK since 1994. This account of the trial is presented in a narrative fashion so that it may not present any difficulties for the reader. 80 patients were involved in the trial for periods of from one to five years. Half of them were already well known because they had been seen regularly by me for from 2 to 17 years. They had all been investigated in depth and in detail, and all were dependent on suppressive drugs for symptom control. 33 were allergic to mites only, and the rest had multiple sensitivities. The group were typical of any allergy clinic dealing with allergies affecting any part of the body. The results were assessed by symptoms diaries kept by the patients, and daily peak flow measurements in asthmatics. At regular intervals the amount of mite allergen in samples of house dust was measured by a colleague who did not know the origin of the samples. I also assessed. the amount of mite in the dust by the size of skin test reactions to extracts of the dust samples which patients brought to each consultation. These patients acted as their own controls by comparing their clinical symptoms charts, the amounts of mite allergen in the dust from their beds, and the size of skin test reactions to extracts of their own dust, for some time before and at intervals after using Acarosan. One application was found to be effective for as long as a year, probably because it has been shown that the mites eat their own faeces, thus recycling the Benzyl Benzoate and prolonging its effectiveness. Assessment of the patients status took account of all body systems involved, need for medication, and peak flow charts for asthmatics. Special attention was paid to other factors such as pets and food allergies or intolerances. At every visit samples of general house-dust and bed dust were submitted, and used to make 10% weight/volume extracts for skin testing as described elsewhere on this website. 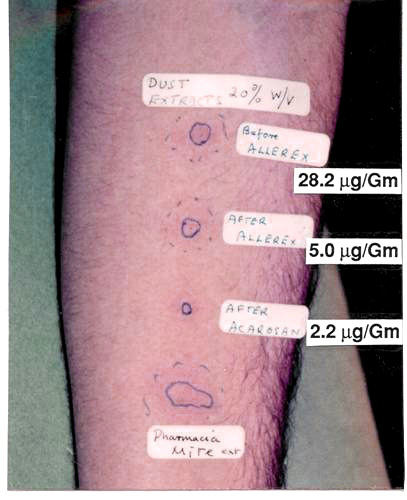 These dust extracts were used for prick skin testing, using Morrow-Brown Standardised skin test needles, for comparison with the reaction to a standardised dust mite extract. The wheals produced by the skin test reactions were outlined with biro, and transferred to the records using document repair tape. The amount of Der P1 mite allergen in the dust extracts was measured by Dr Terry Merrett, using monoclonal antibodies donated by Professor Martin Chapman of Charlottesville USA. 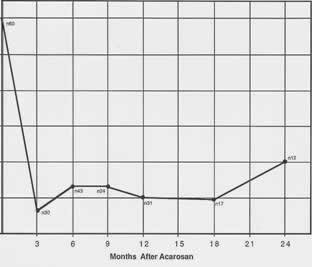 Once a satisfactory baseline of symptoms and treatment had been established a supply of Acarosan was issued with full instructions and a video on its use on bedding, mattress, carpets, and soft furniture. 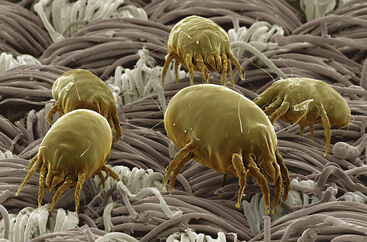 No other methods to control mites were used, and no change in cleaning routines was suggested. 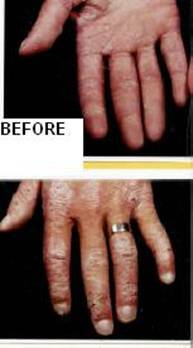 Acarosan was not used again until there was evidence that further application was necessary, as shown by Der P1 assay, skin tests using extracts of patient’s own dust, or increasing symptoms. It was very surprising that the effects of one application of Acarosan lasted so long. The explanation was that they eat their own faeces, thus recycling the benzyl benzoate which kills them off. 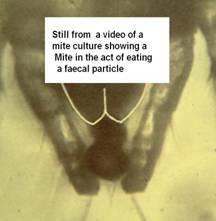 On the left is a video still donated by Dr J Rees where a mite is seen with a faecal pellet in its jaws. On the right a fluorescent dye was attached to the benzyl benzoate so that is could be seen under fluorescent light. 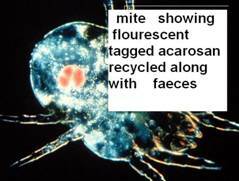 The tagged benzoate is easily seen in the gut of the mite. John was 19, and was first seen when he was three with rhinitis, asthma, and eczema due to dust mite, dogs, and horses. By 1988 control was becoming more difficult, with increased sneezing, blockage, itchy eyes, itchy palate and ears, and eczema. Three days after treating bedroom and living room with Acarosan these symptoms all disappeared and no treatment was required for the first time in 16 years. 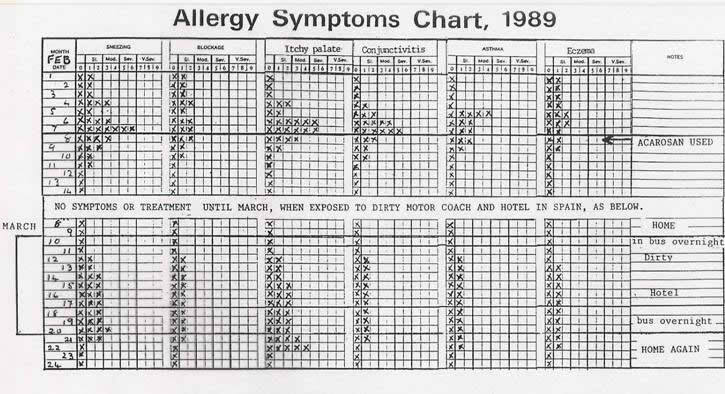 A month later exposure to a dirty old motor coach and an unclean foreign hotel caused a temporary relapse of all the symptoms, including the eczema, as shown by his excellent charts. This unexpected challenge emphasised the dominance of the mite allergen in all his complaints. On return home he had no problems for 11 months, when a recurrence of his symptoms was associated with an increase in the skin reaction to an extract of his own dust, and in the Der P1 assay, so more Acarosan was issued. He then remained symptom free for another three years when he had a slight relapse of the rhinitis and the eczema, which cleared after using acarosan on his surroundings. By 1992 he was at college, had ceased to need inhaled steroids, and was active in sport without asthma. 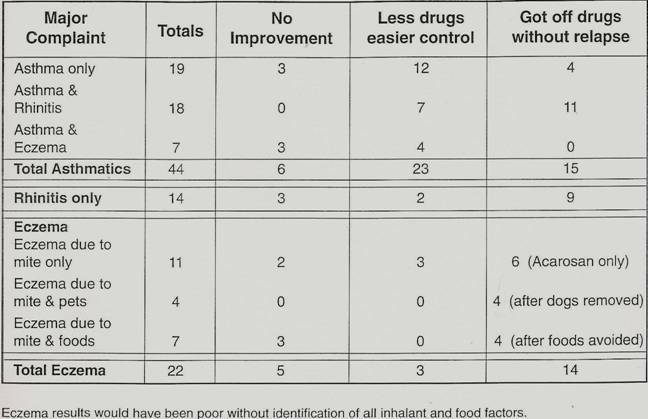 Allan was 46 when he joined the trial in 1991 with a history of asthma and rhinitis since age 17 well controlled with Becotide and Ventolin inhalers and an average Peak flow of 405l/min. His son David aged 13 had had asthma and rhinitis for 5 years, effectively suppressed with the same medication, and an average peak flow of 365l/min, but exercise induced asthma prevented him playing any games. In both father and son skin tests were markedly positive for mites, and both had RAST 4+ for mites. After the house was treated with Acarosan father’s peak flow rate did not increase and he needed the same medication, as repeated efforts to reduce medication were ineffectual, but exposure to dust in the house did not affect him as it had done previously. Treatment of the house had a striking effect on son David, as within two months he was able to stop all treatment except for an occasional puff of Ventolin, and he could play sport with no exercise asthma. After a year his average peak flow was 364 without any treatment at all, and he.has remained free from asthma ever since. After two years he entered for the 1500 metres at the school sports, and then discovered that he had left his ventolin inhaler at home. He did not panic, and won the race without even a wheeze. His elder brother had no allergy problems so his room was not treated until he complained that mites were crawling across the viewfinder of his new camera, and he captured a few which were identified as Lepidoglyphus destructor, the species of mite which is usually found on farms. The dust from his room assayed very high, and an extract of his room dust produced a reaction on his father’s skin 17 mm in diameter, but produced none at all on his own skin as he was not an allergic person. The reason for the infestation was that he ate biscuits when studying, and destructor loves to live on cereal., so his room was also decontaminated. David has continued to be free from asthma and is now aged 29. Until age 19 both skin and blood tests remained very positive without symptoms to match, while the assay of his dust remained very high,. a finding which could have been very confusing. Clearly he had adapted successfully and no longer reacted to mites, perhaps because a window of a relatively mite free environment had been created for a few years. He seems to be a definite cure. Father Allan also recovered, as five years later he had stopped his Becotide and his peak flow rates were 455, but the skin tests were still very positive. Ten years later he is well on inhaled treatment only. Stephen was 29, and had had eczema for three years which was so severe that three different dermatologists could offer no alternative except indefinite oral steroids and steroid creams. When first seen he had severe generalised weeping eczema, was almost suicidal, and was taking 10 mgms of prednisolone daily. Prick skin tests were very positive for mites, and also to an extract of his own bed dust, which assayed at 229 micrograms of Der P1. This is very high, as 5-10 micrograms is unacceptable in the home of a mite allergic patient. 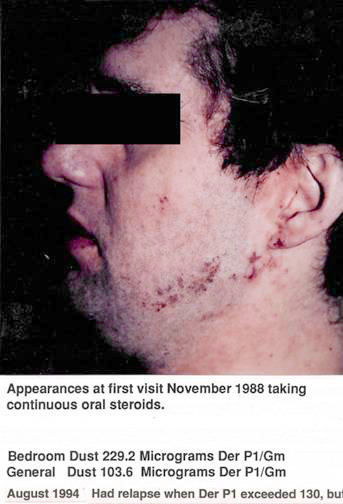 Following the use of Acarosan in bed, bedroom, and living room he was able to stop oral steroids and was about 80% improved in a month. By 3 months he had cleared completely, and remained clear without any treatment until he spent a weekend in a dirty and dusty flat. 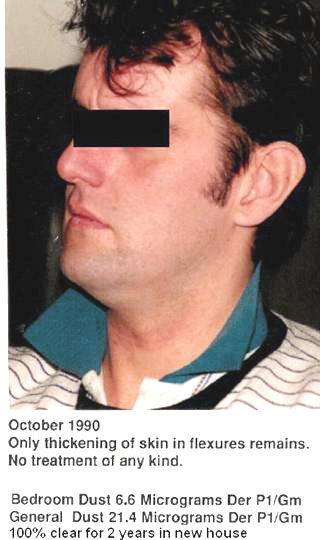 After the first night he began to itch, and after the second night he had a severe relapse of the eczema lasting two weeks and requiring a course of oral steroids. During the next two years the eczema cleared up completely, in spite of the fact that the amount of Der P1 in the dust increased to 33 micrograms, and his brother developed asthma due to mites. 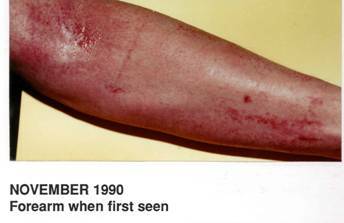 His eczema did not relapse until the Der P1 reached 98.5 in November 1991, cleared after using Acarosan, and relapsed again in 1992 when the Der p1 reached 133 micrograms, but cleared in two weeks after Acarosan. 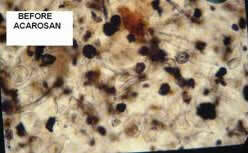 Subsequent follow-up to 1995 revealed that slight relapses occurred every year which were abolished by using Acarosan. Further contact has been lost. Alan aged 29 and his two daughters aged 21/2 and 4 years all had eczema. The younger child cleared completely on avoiding egg, but the elder child had a big skin reaction to mite, and also to a family dust extract, which assayed at 28 micrograms of Der P1. 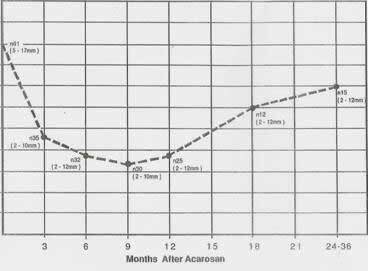 At first another acricide (Allerex) was applied, but after using no less than 4 litres there was only slight improvement in the eczema and in the skin reaction to the family dust extract, but the assay was down to 5 micrograms. Acarosan was then introduced, and after 6 weeks there was no skin reaction to the family dust extract, which assayed at 2,2 mcgms, Father’s life-long eczema subsided, his hands were clear for the first time in his life, and daughter cleared completely. The skin tests shown were carried out on the father’s skin. A few months later a new wool carpet was laid. After six weeks eczema recurred on the child’s knees, but cleared after acarosan was applied to the new carpet, suggesting that it had become colonised by mites in that short time. One year later the family moved to a completely renovated old house with more space, taking with them all the treated carpets and furniture. Within four months the elder child’s eczema was reappearing, and she had her first asthma arrack. Her sister aged 2, whose eczema had previously disappeared after avoiding egg, now developed slight eczema. The assay of the Der P1 in the house dust of their new house was found to be 24 micrograms, nearly as high as the first assay before the previous house was treated. Skin testing revealed that she had now become positive to both mite extract and to bed dust extract, yet she had been negative only a year before. With liberal use of Acarosan the itching, scratching, and eczema cleared up, and three years later eczema had not recurred in any member of this family. This family affair shows how closely mite infestation can be related to the eczematous reactions of a family living in a Victorian house with more accommodation which must have had an unseen and unsuspected population of mites which re-infected their bedding, furniture, and carpets, previously treated with Acarosan. Mary was first seen aged 26 with severe hand eczema, due to dust mite and was carefully desensitised with considerable improvement for five years, but slowly deteriorated until seen again aged 44. She had been hoovering her five year old mattress regularly every few weeks as instructed. 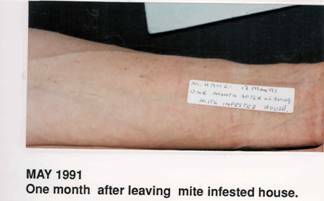 The skin test reaction to the standard mite extract was 12mm across, but to her own dust extract it was 17mm, with a severe delayed reaction the next day. Her dust was found to be loaded with faecal particles in spite of the fact that another acaricide, Actomite, had been used on bed and bedding a month before, and the Der P1 assay was very high at 312 micrograms. 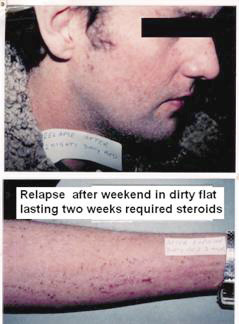 The microphotographs show the remarkable decrease in faecal particles after only 21 days and in the skin test reaction. Mark was 35 and had had mild eczema since infancy, as had mother and brother. Four dermatologists had been consulted at various times. One did patch tests which showed nickel sensitivity, but none did skin prick tests. He had been much worse since purchasing an old damp house and spending much time renovating it. A local dermatologist had admitted him to hospital twice, and he had had oral steroids several times in the previous year.. The only occasions when he had been better was when camping, or when in hospital for a week without treatment, only to relapse within two days on return home. When seen he had very severe weeping eczema requiring oral steroids for control. Prick skin tests were +++++ for two species of mite and for his own dust extracts. His Total IgE was the highest ever seen at 43,000 units ( normal maximum about 100) with specific IgE ++++ for 5 species of mite. He saw mites crawling on a black surface, and captured some for identification. Attempts to control the infestation with acarosan were relatively ineffective, which was not surprising because the previous owners had covered many walls with polythene and stuck wallpaper on top, the whole acting like blotting paper in damp areas Four months later he moved to a modern flat with new carpets and furniture. He stopped itching in a week, and the eczema was negligible by three weeks. In this case the infestation was so bad that the acaricide could not control it. The lesson is that anyone with mild eczema would be unwise to buy an old house, especially if damp. Andrew was aged 15 with severe asthma and rhinitis controlled with steroid inhalers and bronchodilators, peak flow average 450. Three months after using Acarosan all treatment ceased without relapse, peak flow averaged 500, all symptoms were absent for the first time In 5 years, and he was able to play football without asthma. Acarosan was used for two years only. The only time he had an attack of asthma was after attending a concert in an old theatre, and after accidental exposure to a dust sample in my consulting room ! His mother was also a dust allergic. She had wheezed every night for 14 years, but ceased after Acarosan was used. The Der P1 assay in his bed was 179 micrograms to begin with, falling to very low levels after Acarosan. Two years later he went off to college, and neither asthma not rhinitis relapsed in dusty students lodgings, and he was able to play football without any problem. Aged 20 he was apparently cured of his asthma as he did not relapse even when his bed dust contained 41 micrograms/Gm, a very high reading well over the recognised upper limit for mite infestation as a cause of asthma. I had been very interested in mite allergy since 1968, when I published the first study from this country confirming that the mite was the major allergen in house-dust, in spite of much scepticism at that time. The story behind this trial is that when attending a meeting in Washington D C in 1985 I heard a presentation on Acarosan which was so interesting that I made a firm contact with the speaker afterwards. I heard nothing more for two years, when the manufacturers wrote asking if I could put them in touch with a company in the UK to market their product. I made enquiries on their behalf but found no interest whatever. They supplied me with many copies of a video regarding the mite and Acarosan, which I sent to prominent members of the British Allergy Society, but nobody seemed to be interested. Finally a small pharmaceutical company agreed to market it, and supplied enough for an open clinical trial. The comment from an employee of a drug company after the first presentation of my results that I was “killing their best friends” is revealing. The improvements correlate well with the decrease in skin tests and allergen in the dust samples lasting for at least a year. The persistence of the acarosan because of the nasty habits of the mites recycling the acarosan was an unexpected finding of great importance, as treatment of the house about once a year or when required is much more acceptable. Recurrence of symptoms on exposure to untreated houses, hotels, and theatres is important evidence confirming the persistence of allergy to mites, and also confirmed that the improvements are due to the Acarosan. Treating the house instead of the treating the inhabitants for life with expensive drugs is a concept which could save many millions from the NHS budget because mites are such a common cause of allergic problems. Improvements in asthma, rhinitis, or eczema in children living in the same house as a patient were noted in ten instances was an unexpected bonus which supports the concept of treating the environment instead of the patient.. The results in eczema are the most dramatic and gratifying, and confirm the importance of mites as a cause of eczema. In the face of this evidence it is even more difficult to understand why British dermatologists still seldom accept that allergy is a very important cause of eczema, and are unwilling to carry out prick skin tests. Perhaps the reason is that some departments may have facilities only for patch testing. The remarkable potency of 10% bed dust extracts suggests that when eczema sufferers are in bed at night, when the itching is at its worst, mite faecal particles on the skin require just a trace of sweat to produce a very strong mite extract which penetrates the cracks in skin which is already damaged, causing intense continuous skin reactions, scratching, and infection. The most important finding by far is that in some young patients sufficiently prolonged absence of mites in the environment eventually brings about re-adaptation and tolerance, so that they no longer react to untreated environments and are able to stop all medication without relapse. This phenomenon has also been observed in Europe in some children who have had prolonged stay at schools in the Alps where the mites cannot survive. It is very gratifying to have actually cured some of these allergy victims, and it seems a great pity that this method of mite control has not been used more widely. These results suggest that if mite control could be used more often in children they would have a chance of escaping from the allergic march.